Framed prints in a car. Columbus Ohio. March 14, 2014. It was a happy/sad kind of day. Happy because it was my biggest art exhibit to date. Sad because it had come to an end. March 14 was the take down day. 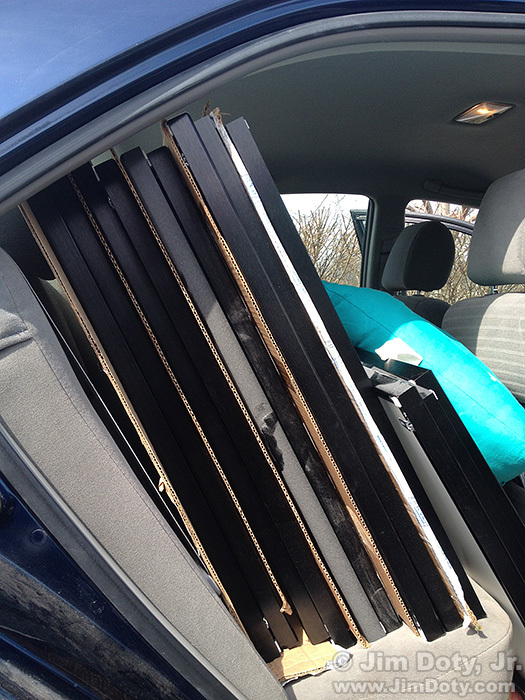 I filled the front passenger seat, back seat, and trunk of my car with framed prints. Before I drove off I snapped a photo of the prints on the right side of the back seat and back floor of the car. Here’s a tip when transporting framed prints. The framed prints are correctly stacked “back to back” and “front to front” to avoid scratches to the fronts of the frames. In between each pair of front to front frames there is a protective sheet of cardboard so the fronts of the metal frames don’t rub against each other. There is no cardboard where the backs of the frames lean on each other. Some photographers put cardboard there too. The frames all rest on the soft fabric of the car seat or blankets on the floor. In the trunk they are surrounded by soft blankets. A pillow keeps the frames from flopping forward if I had to brake hard. This is the only photo for March 14 in my “favorite photos” folder, so it is, by definition, my favorite photo for this date. This entry was posted in Photographs by Jim. Bookmark the permalink.